10 useful iPhone tips & tricks - iPhone.MY - Daily News On Mac, iPhone, iPads, iPods and more! It’s time again for another iPhone tips & tricks post. The last time I wrote one of these posts was over two years ago, but almost everything in that post is still relevant today. Have you ever dialed someone and then needed to call the same person right back? Even though the iPhone Phone app provides you with a nice list of the outgoing and incoming calls with the Recents list, when you’re in the Keypad section it doesn’t provide you with the one function button that most phones made in the past couple of decades have. 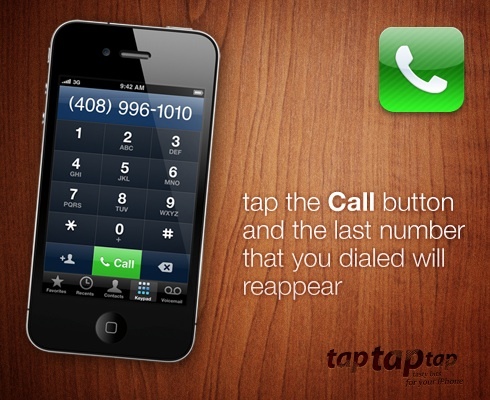 If you simply tap the Call button, the last number that you dialed will reappear, all ready for you to redial it. Even for its flaws, autocorrection/autocompletion is one of the iPhone’s best features. 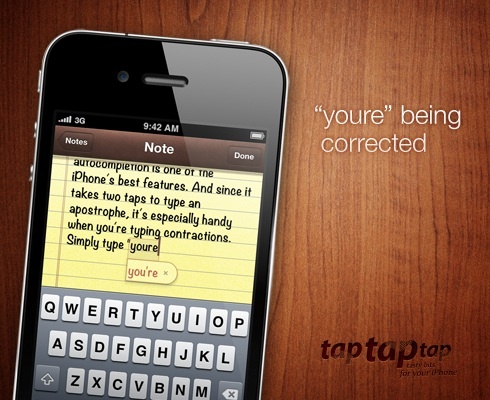 And since it takes two taps to type an apostrophe, it’s especially handy when you’re typing contractions. Simply type “youre”, “dont”, or “its” and as soon as you tap the space key, the words get magically transformed into “you’re”, “don’t”, and “it’s”, respectively. It looks like Apple was thinking a bit forward when they created autocorrect and provided a bunch of somewhat nonintuitive, “misfit” autocorrections that can come in handy when your typing is flowing along. 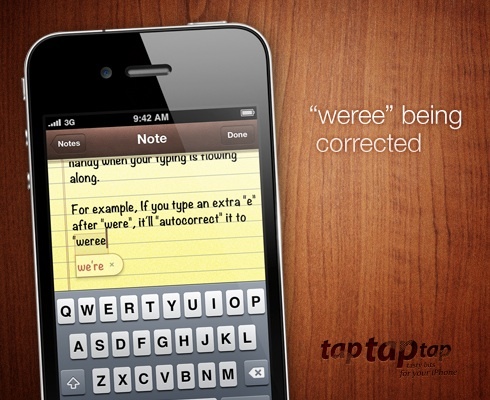 For example, If you type an extra “e” after “were”, it’ll “autocorrect” it to “we’re”. Granted, you have to shift your thinking a bit and change the way these words are “spelled” in your mind. But you’d be surprised how fast your mind can adapt to it, especially if you do a lot of typing on your iPhone. Note that depending on your typing patterns (the autocorrect system adapts to what you commonly type over time), some of these may not work for you. Also note that these particular autocorrections are dependent on your iPhone’s language being set to English. 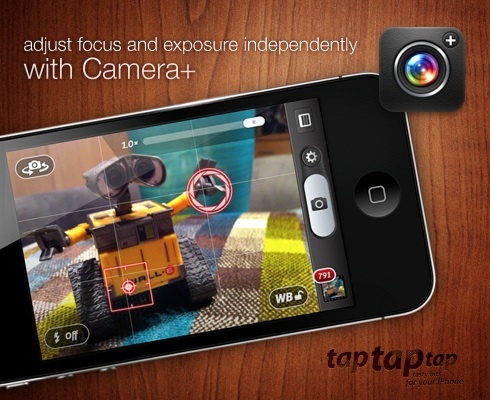 Tap to focus is a great feature of your iPhone’s camera. With just a simple touch, you can have the camera bring an object into focus and even do some cool depth of field effects. But did you know that with the tap to focus system, you’re also able to adjust the exposure of your photos… meaning their lightness or darkness… as you shoot them? When you tap to focus, not only does the camera adjust the focal point to the point you’ve tapped, but it also adjusts the exposure based on that point. 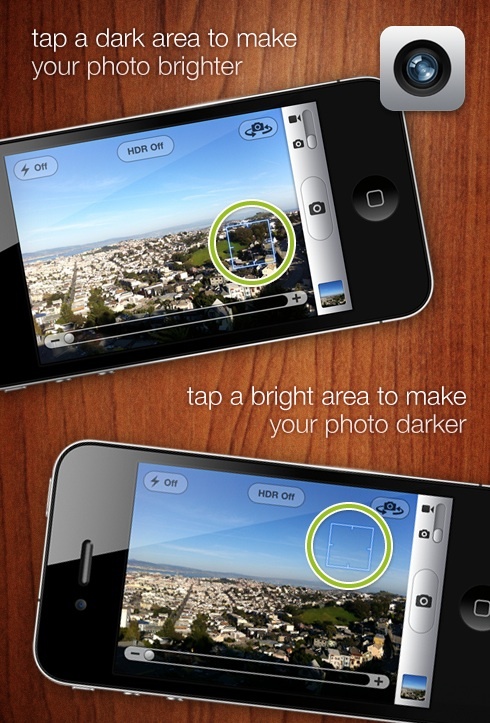 In a nutshell, if you want to make your photo darker, tap a bright area of the preview and if you want to make your photo lighter, tap a dark area. Behind the scenes, the camera’s adjusting the ISO and shutter speed to set the exposure. Bear in mind that both focus and exposure are tied together with the standard Camera app. But if you use our very own Camera+ app (and if you ignore this shameless plug), you’re able to adjust both independently for fine control over your photos. This comes in handy if you’d like to focus on a particular object while still being able to control the lightness or darkness of the photo. I see a lot of hands. Good. Ok, still a decent amount of hands. For those of you who weren’t aware, one of the most significant things that Apple added to iOS 4 was the screen orientation lock and that’s where you’ll find it. If you’ve ever been frustrated by your iPhone’s screen rotating when you weren’t expecting it, this one little control will put an end to all that. Aha, not so many hands remain! 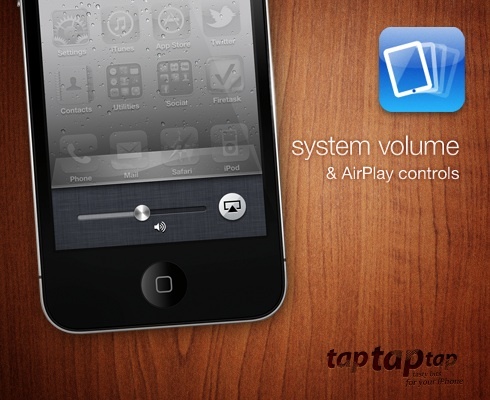 The volume controls have become somewhat of a point of controversy for iOS devices. From their inconsistent behavior (does pressing them set the ringer volume or the system sound volume? 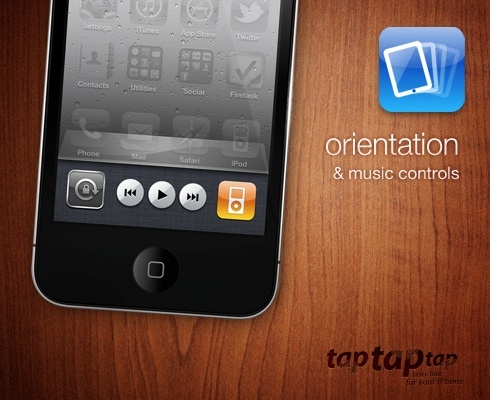 )… to Apple repurposing them (they tried to change the iPad orientation lock switch to a mute button only to flip-flop and offer it as a setting later)… to developers changing their behavior and getting apps booted from the App Store… there’s no doubt that those controls can have confusing behaviors in some circumstances. The good thing is that the volume slider that’s located here has one function and that’s to control only the system volume. If you’ve ever been frustrated because you were about to play an audio or video track and wanted to preemptively lower the volume so you wouldn’t disturb others around you… only to inadvertently lower the ringer volume, then this slider’s for you. Moreover, on the secondary swipe panel, you’ll also find a very handy AirPlay control if you have any AirPlay-enabled devices on your network. 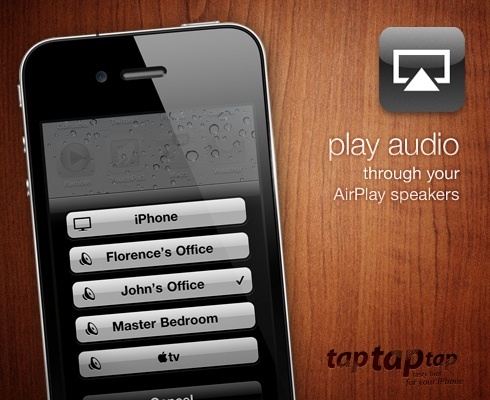 You’ll be able to play audio from most of your apps through your AirPlay speakers by choosing them here. This feature is surely handy if you have poor vision. But it also comes in handy if you’re a designer or developer and you ever have the need to get a close-up of your screen at the pixel-level (details, details!). To enables this gem, go to your Settings app and tap General. 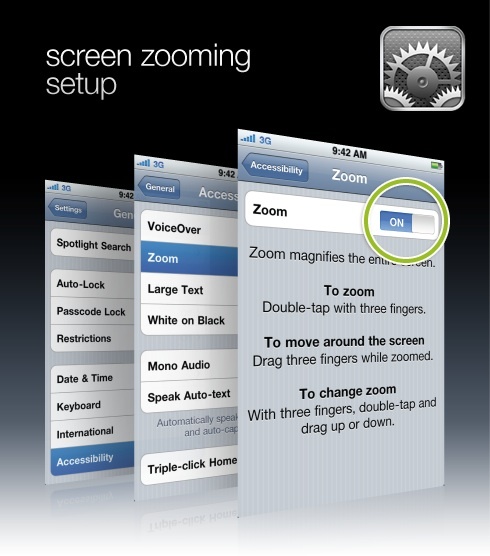 Then tap Accessibility and then tap Zoom. Flip the switch to on and then you can three-finger-double-tap your way to screen magnification bliss whenever your heart desires. Sometimes when you tap something and hold your finger down on what you tapped, you reveal additional functionality. In Safari and Mail, you can do this on links and images to display action sheets with the additional functions. 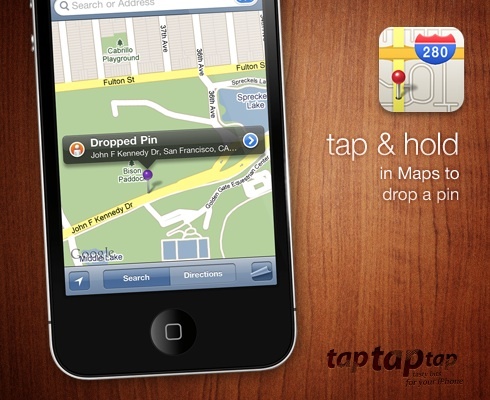 In the Maps app, when you do this, it drops a pin on the location you’ve tapped. This can come in very handy when you want to remember where you parked your vehicle. 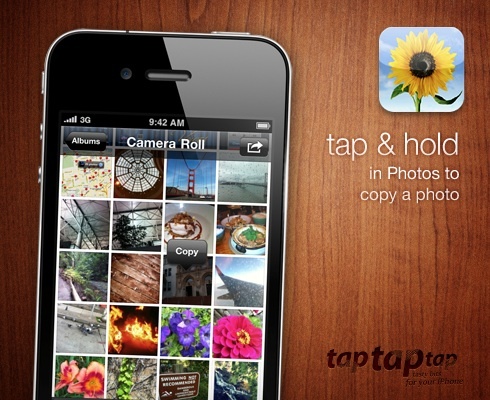 In the Photos app, tapping and holding a photo displays a popup control, enabling you to copy the photo for later pasting. 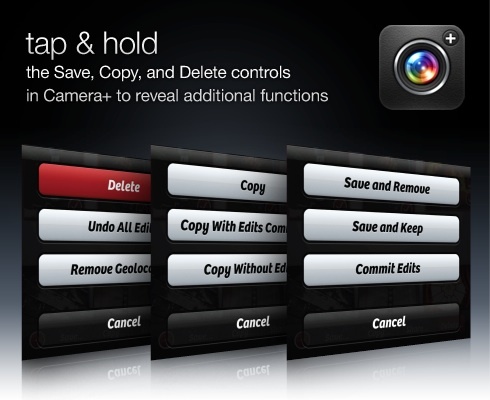 And we utilize this convention in our own Camera+, where tapping and holding the Save, Copy, and Delete controls displays action sheets with additional, handy functions. 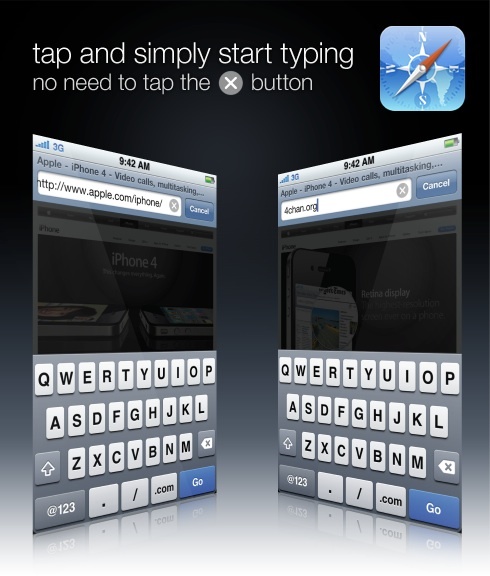 I can save you one tap for every address you enter into the Safari address bar. Over a lifetime, this could potentially save you somewhere between seconds all the way up to years of time, depending on your browsing habits. I’m giving you the gift of life… make the most of it. When you tap the address bar in Safari, the obvious thing to do when you want to replace the current address with a new one is to tap the ’x’ icon to clear the current address before typing the new one. But there’s a little, handy shortcut that almost nobody seems to know about… simply start typing and it’ll replace whatever address was in the bar. Normally on your iPhone, you’d expect this behavior only when a text field has all the text in it selected and it’s definitely not standard behavior for other text fields. Take, for instance, the one residing directly to the right of this one in Safari… the search field definitely behaves the standard way. When you tap the search field again soon after entering a search term, the insertion point is placed at the end of the previous search term so that you can easily add to it if you’d like. This is likely what most people would want to do in this situation. So even though it’s somewhat inconsistent behavior between the two fields, it seems like Apple did some thinking along these lines and made each text field operate most efficiently, depending on the context of how the field is used. The unfortunate thing is that the address bar shortcut is pretty hidden. When an app relies on a non-obvious gesture or sequence of taps to perform a core function, it’s bad UI design. It’s important to note the two phrases “relies on” and “core function”, though. If the app supplies another obvious way to perform the function, even if it’s more work to do so, then this is acceptable. Likewise, if the function isn’t a core function, this is also acceptable. The non-obvious method essentially becomes a shortcut. The biggest issue with these shortcuts is having users be able to discover them. Unfortunately, there’s no easy way to find them… it typically takes a bunch of somewhat random taps, pinches, and swipes in various places in an app to see what hidden gems turn-up. 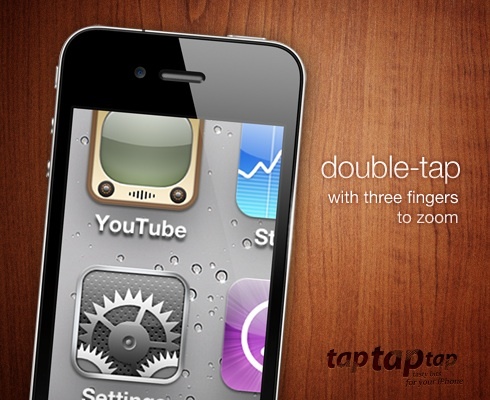 Double-tapping many things on your iPhone typically results in zooming-in on what you’re tapping. But sometimes you want to see things at actual size (100% zoom level). You can do this for images in Safari if you double-tap them with two fingers. This is a very nice feature and it’d be great if it turned into a convention. If Apple used it in more of the standard apps and if 3rd-party developers added it to their apps where appropriate, then it would become one. For the sake of practicing what I’m preaching, I just added it to our Camera+ to-do list. If you’re zoomed into an area while you’re browsing a webpage in Safari, you can double-tap toward the top or bottom of the page to scroll up or down approximately a half page. Why only a half of a page versus a whole page? I don’t know, but I think it would’ve been much more useful to scroll about a whole page at a time. Nonetheless, it’s still a handy alternative scrolling method. Sometimes, when you double-tap things to zoom on your iPhone, it behaves such that the first double-tap zooms in and the second zooms out… it’s like a zoom toggle function. But sometimes, the more you double-tap, the more you zoom in. This is how zooming works in the Maps app. So how do you zoom out in this latter case? Generally, the only way to do so is to pinch. 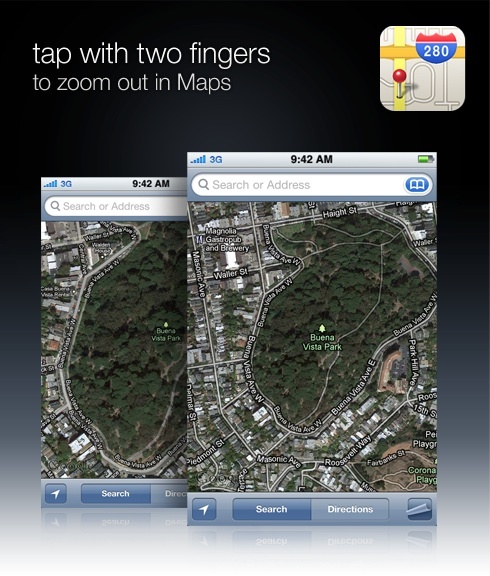 But in the Maps app, if you single-tap with two fingers, it zooms out. When I use this, I almost always inadvertently double-tap with two fingers, zooming out one more level than I desired, though (like the first time I tried to capture the above screenshot). But it’s still a useful shortcut. 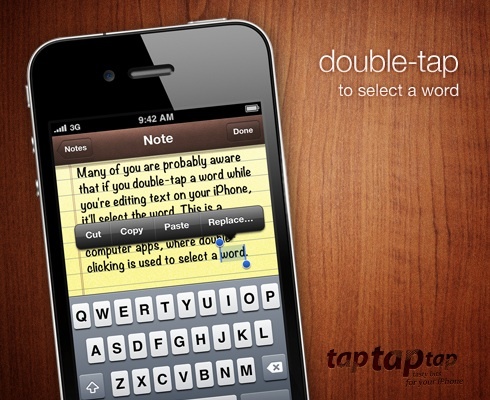 Many of you are probably aware that if you double-tap a word while you’re editing text on your iPhone, it’ll select the word. This is a carryover from text editing on most computer apps, where double-clicking is used to select a word. But in most computer apps, triple-clicking text will select a whole line of text and this is where the similarity starts to break down… on the iPhone, triple-tapping text usually does nothing. But all isn’t lost and thankfully, Apple carried over one of the other very useful text editing conventions… paragraph selection. 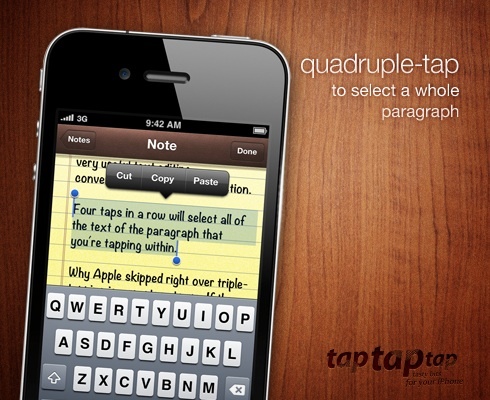 Four taps in a row will select all of the text of the paragraph that you’re tapping within. 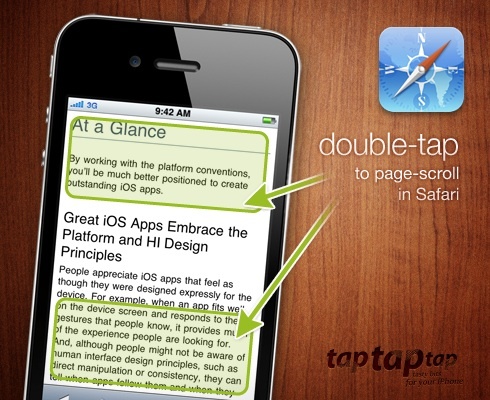 Why Apple skipped right over triple-tapping is a mystery to me. If they felt that selecting a whole line of text wasn’t very useful, I think that it would’ve been better to make it so that paragraph selection was done with triple-tapping instead of quadruple-tapping. When you do these multiple taps, you need to do them all on approximately the same point, and relatively quickly, for them to be interpreted correctly. And the more taps you do, the more likely you are to move slightly. As a result, attempting to quadruple-tap sometimes results in failure, which can be somewhat frustrating. Ah, consistency. When a system adheres to it, it can make for a wonderful and intuitive experience. Apple has set a pretty strong precedent with the convention that if you want to search within the context of what you’re currently viewing, you can expect to find a search field at the top of the screen. They’ve done this with apps like Mail, Notes, Messages, iPod, and Contacts. 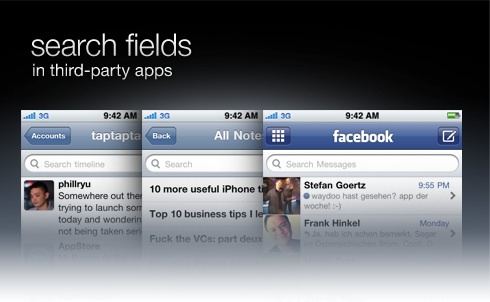 Sometime you need to pull beyond the top to reveal the search field, but you can generally count in it being there. Since the precedent was, in fact, strong, many 3rd-party developers followed suit and implemented a similar content search in their apps. 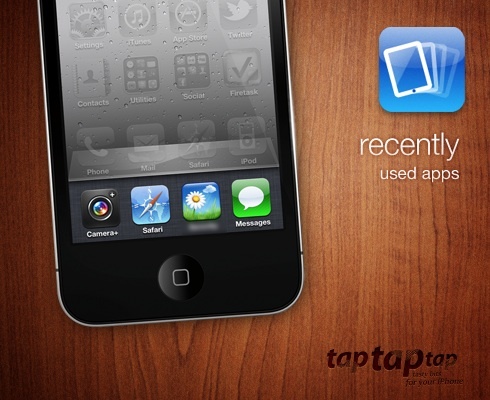 A few prominent examples are in the Twitter, Simplenote, and Facebook apps. 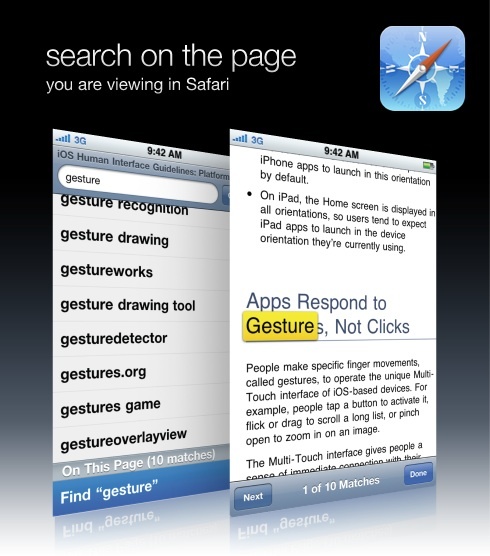 So, why did Apple choose not to do the same for Safari? Well, I can’t answer that question and for the longest time, besides scanning it with your eyes, there was simply no way to search on the webpage you were currently browsing. 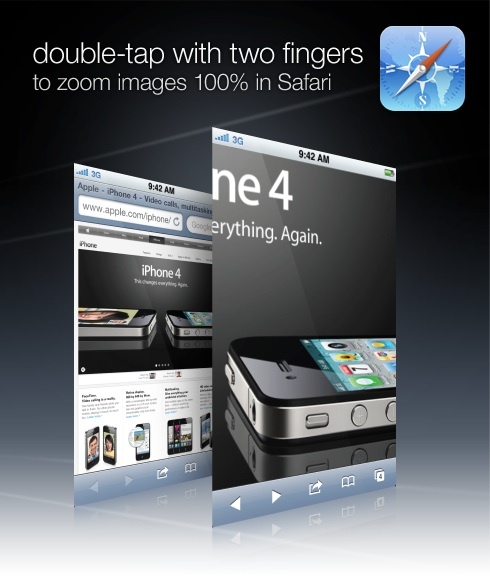 But with iOS 4.2, Apple did bring that functionality to Safari, albeit in an inconsistent and somewhat convoluted way. I’m sure that all of you are well aware that the field to the right of the address bar enables you to search using your preferred search engine (Google by default). But did you know that this same search field can be used to search within the webpage you’re currently browsing? To do so, enter a search term in the field and then scroll to the bottom of the list that appears (in the “On This Page” section). It’s a weird mechanism for performing this kind of search. My biggest gripe is that the search field title of “Google” doesn’t accurately reflect that you’re able to do this so it basically results in hidden functionality. But it does work at least. I just think that a much better solution would’ve been for Apple to implement a pull-down search field for this. 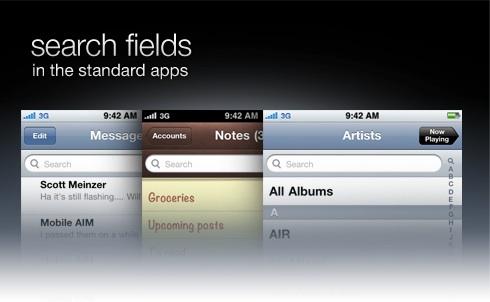 It would’ve been consistent with many other apps and much more discoverable. Got any additional tips & tricks?